Q. How do I download an EBSCO ebook? When you search from the library homepage, you're likely to see results that are eBooks from EBSCO. These books show a "PDF Full Text" and a "Download (Offline)" link. The "PDF Full Text" link will take you to the on-screen reader. The "Download (Offline)" link will allow you to download a time-limited version of the entire PDF for offline reading. Downloading the full PDF requires an account with EBSCO and having Adobe Digital Editions or Bluefire Reader installed on your computer. If you don't already have an account, please click "Create a new Account" and fill out the information requested. Once you're logged in, you can download the book. 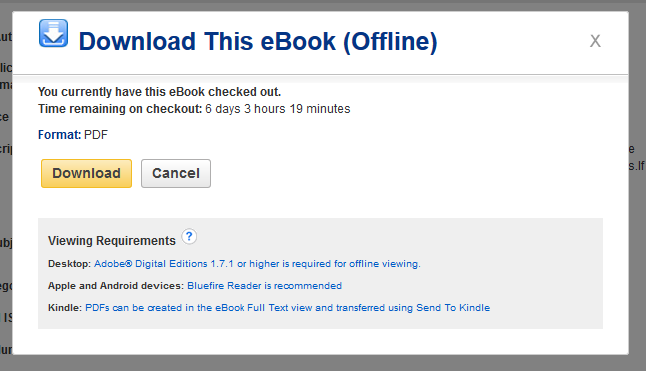 If you don't have Adobe Digital Editions (or Bluefire Reader) installed, the download screen has links to install them. The downloaded PDF will expire 7 days from download. If you want to continue to use it, you'll need to re-download it. If you have trouble with this download process, there is an alternate route to offline reading, which has different limitations. Instead of a time-limitation there's a page count restriction (which varies by book and is set by the publisher). You can click through to the onscreen reader using the "PDF Full Text link" and then use the "Save Pages" button at the top to download a portion of the book. 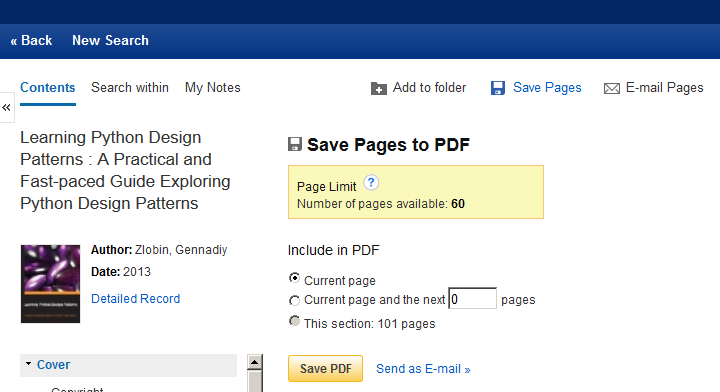 Once you click the "Save Pages" link, you'll see how many pages you're able to download for this specific book. Pick the set of pages you want to download and click "Save PDF" to save the DRM-free PDF to your computer.